Our intrepid Singapore sommelier, Shalom Chin, has filed a heroic piece on the Southern Rhone Valley and the much-underrated Cotes du Rhone Villages wines. Sommeliers take note; this is the level of writing skills and opinion you should be attaining. Wine enthusiasts take note; it’s time to be listening to and reading what sommeliers have to say, they are at the coalface and the new gatekeepers to wine discovery. For many, the wines of the Côte du Rhône AC are considered to be the lowest of the hierarchy of Rhône wines followed by the mid-tier of Côte du Rhône Village AC and finally, the highest tier of Rhône Crus. Partially because of the price and marketing of CDR wines, there are many who would consider it the equivalent of a Burgundy village or a Petit Chablis. Personally, I do not share the same views. After spending some time in Southern Rhône to taste CDR wines, I believe that quality-to-price ratio of CDR wines can give many wines made in the similar style of Grenache Mourvèdre Syrah (GSM) and Viognier Marsanne Roussanne blends a run for their money. What I love about wines from the Côte du Rhône (CDR) is both its affordability and the average quality which has improved significantly over the last decade but selecting a good bottle can be a pain. The CDR itself has around 171 communes, around 40000 hectares of land spread out among 6 different counties of the Vaucluse, Gard, Drôme, Ardèche, Rhône and Loire. This is excluding the CDR villages which has over 95 communes; 18 of which are allowed to have its village name on the label of the bottle. While we are seeing an increase in the average quality overall, we can also get a wide selection of choices from 5000 producers and a high difference of quality among them, from the very best to the abhorrent. When walking into a supermarket to make decisions, it all comes down to trial and error unless you have information on the reputability of the producers. Produces red, white and rosé wines. The minimum alcohol is 11%. Basic yields of 43hl/ha. The minimum alcohol is 12% for the whites and rosé, 12.5% for the reds. Basic yields between 37 and 40 hl/ha. The soils are varied but are a mixture of gravel, sandstone, clay, loess and limestone. Mostly stony limestone-clay soil which produces more complex wines, deeper colour and more power on the nose. The white wines are planted on more stony and sandy soil. Focusing is on the 18 named villages of CDR, It can be a challenge to tell the difference among them but there are clues. This is not Burgundy. Unlike the individual Grand Cru vineyards of Burgundy, the smallest village, St-Pantaléon-les-Vignes, has 59 hectares of land. The soils are not homogenous throughout the individual villages. Depending if they are near a river, the soil structure tends to change from sand or alluvial soil near the river to stonier, limestone-clay soils as it goes up the hills. Elevation for each village differs but the average highest point is around 350 meters above sea level. Considering that each village is scattered from the North to the South of Southern Rhône, temperatures are varied which gives different sugar levels and harvesting dates. Moreover, with rivers near some villages, this can play a part in the microclimate by moderating temperatures during the summer. Back to the million-dollar question, how do we make the best choice in a situation where we have to choose one out of 18 villages for a pleasant drinking session tonight? The chances of getting a wine that suits your palate is as good as winning a bet on a horserace of 18 horses, so we have to make the calculated risk by understanding the layout of the villages and the type of soil where the grapes are grown on. With 18 villages, I only managed to taste a third of them which are the more popular ones. The Gard County is on the left side of the Rhône River running down towards Avignon. It contains 4 villages: Saint-Gervais, Chusclan, Laudun, and Signargues. The Drôme County which has 4 villages: Rochegude, Rousset les Vignes, Saint Maurice and Saint Pantaléon les Vignes. They are all between the Lez and Aygues river. These villages are considered the northern part of South Rhône. 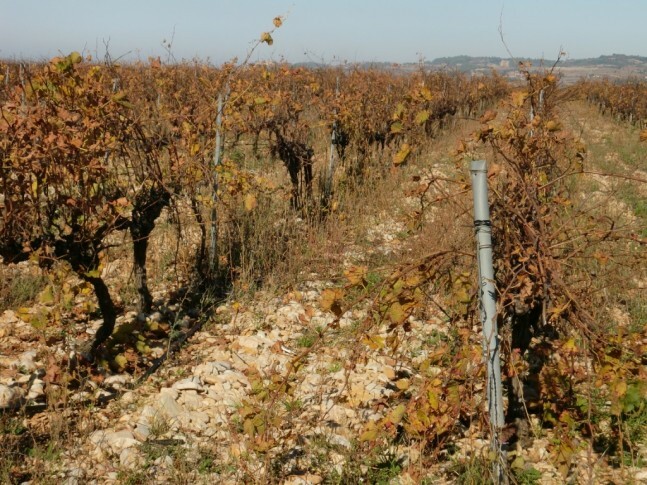 Cairanne – Although most of the vineyards are on a bed of sandy soil the top soil has a mixture of gravel and clay at the bottom of the slope and limestone-clay terraces as you go up in altitude, the terraces with the limestone-clay soils are where the better reds are made. The wines tasted from here are of Domaine Boissons. The reds here gave me an impression of savoury, earthy and mushroom characters with heavy, pencil lead, espresso flavours and full-bodied. Rasteau – Going up to as high as 350 meters, Rasteau has one of the best soils in the South. The slopes have a southern aspect, ensuring maximum exposure to the sun and ripeness for the grapes as well as protection from the Mistral wind. The soils, although sandy have a good layer of limestone and iron on the topsoil. Domaine de Trapadis makes white wines from this area with both a minerality and steeliness to it. The reds are juicy and inviting. Roaix – This village has vines planted near the l’ouvèze river but the better vines are near the top of the village where there is a thick layer of gravel, marl and limestone. This allows the vines to be pushed to produce better quality fruit. Domaine Elodie Balme uses fruit from this village although her facilities are based in Rasteau. She makes CDR Rasteau as well. Elodie is a highly talented young winemaker who comes from a new school of winemaking. She was mentored by Marcel RIchud, who is known for his high quality in Cairanne. With a modern approach to winemaking, wines from Roaix can be full of cherry-aid notes with a palate that is meaty, savoury and brooding. Sablet – Not far from the l’ouvèze river, the village name is derived from the world sable which is French for sand. The village itself is built on sandstone and the vineyards are located not far from Gigondas, in the north of the Dentelles de Montmirail. Soils are mostly sandy and gravelly which makes the village great for white and rosé wines. Domaine les Goubert provided the wines for me to taste. They are definitely a benchmark from this village. The whites are floral, honeyed and full of almonds with a good minerally structure and persistent acid. Contrary to the literature out there, Sablet whites can be laid down even after 9 years as seen in my tasting notes. The rosé can be complex, with berries and a spicy palate. The reds are grown on limestone clay higher up the slopes but most of the marl is found deep in the soil structure. The reds are full-bodied but elegant, full of spicy pepper and provencial herbs with a balance to it. 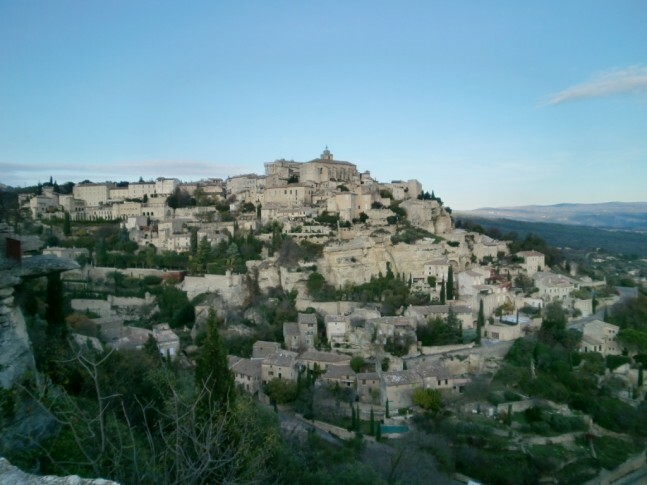 Séguret – This village has a good proportion of vines being grown on a stony top layer of limestone and a portion of its vines on a plateau of hard limestone rock at a high elevation of 300 meters. Moreover, it is situated at the foot of the Dentelles de Montmirail. Yields here run to a maximum of 36 hl/ha. When it comes to this village, Domaine de Mourchon blew me away not only with their modern style, but they are the only ones I know in the village that makes a single varietal Grenache and single varietal Syrah. Signarges – With an average altitude of 150 metres, the climate is drier and warmer than other villages. It is also the southest of all the 18 villages with predominantly sandy soil. There is an area at Rochefort du Gard that has a thick layer of limestone which makes some fantastic wines. The Vignerons de Tavel makes examples of this. Massif d’Uchaux – The Massif is spread out over 5 communes and the soils are immensely varies here, changing greatly from plot to plot. Siliceous and calcareous sandstone of varying thickness dominate this area. Domaine Boissons’s Clos de la Brassière was the only wine I have tried from this region. Before knowing anything about the geology of this region, it was strange to have noticed aromas of gravelly, graphite bits. I suppose the soil contributes to deep colours of this wine as well as the dark fruit flavours, producing a rock solid style. Semi-opaque purple colour. The nose is meaty, spicy, blackberry, slightly lifted fruit, medium intensity. On the palate, meaty, medium(+) acid, black fruit, lots of flavours, prunes, long length and a finish that taste like apricot skins. The wine is fermented and aged in stainless steel vats. The grapes come from limestone sand and red clay. Do note that wines produced within the CDR Zone, such as Châteaunuef-du-Pape can be declassified to a CDR wine. The whites are harvested at different times, pressed immediately and put into separate tanks. The best parcels go into small barrels. 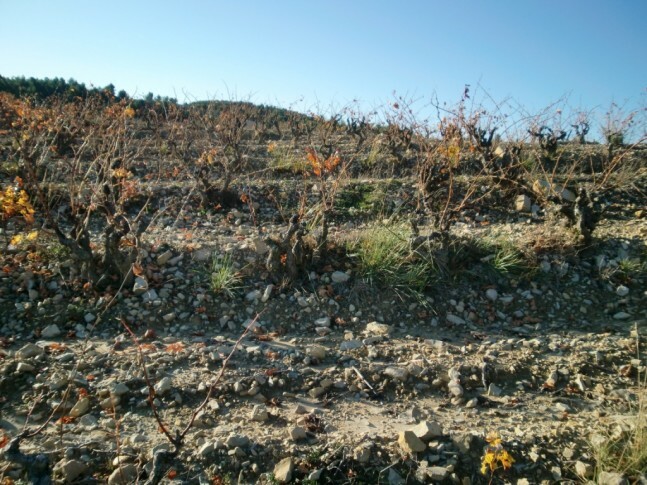 The soils of their vineyards are sandy soils on a flatland and clay up in the forest. The reds are fermented at 25-27°C for 8 days and the whites are 20°C. The maceration period for the reds can be up to 33 days. The Syrah spends 12 days in ferment and 21 days maceration. CO2 gas is used to cover the must to limit oxidation. For the whites, sulphur as a liquid is added to the tanks when the grapes arrive. The barrels are Francois Frères. Tartaric acid is added to the wine for acid adjustment. No délestage is done to the reds. Pale green colour. Peach nose, upfront fruit, honeydew, med(+) Intensity. On the palate, steel, med(+) acid, a bit hard on the mid-palate, phenolic, short length. Pale yellow colour. Banana and honey notes, medium intensity. On the palate, butter, medium acid, medium length, slight bitter in the back. 30-40% fermented in cask and part has gone through MLF. Pale pink colour. The nose is neutral. The palate is more vinous and light. Both bleeding method and direct pressing is used. The lack of fruit is due to the skin contact being light, resulting in high acid and less fruit flavours. Deep purple colour. Beetroot nose, stewed plums, chocolate, light vanilla, soy. On the palate, fruitcake, high tannins, chalky texture, soy, dark chocolate, med(+) alcohol, short length, soy finish. Although a CDR, the vines are from Cairanne. Deep purple colour. Nose of soy, medium intensity, lightly oxidised, earthy. On the palate, high tannins, pluckery, pencil lead, tight on the palate, medium length, light phenolic characters, smoke tar, ink. Deep purple colour. Nose of prunes, stewed plums, rocky, schist earth, pencil lead. On the palate, high tannins, pluckery, lots of prunes, stewed fruit, granite, ink, medium acid, med(+) length, earth and sweet prunes in the back. Deep purple colour. The nose is prunes, light bandage medicine, soy sauce, med(+) intensity, menthol, light mushroom and earth. Palate is liquorice, med(+) tannins, dusty texture, med(+) length, coffee espresso and prune finish, medium acid, menthol-like. Semi-opaque purple. Candied nose, med(+) intensity, cherry-aid. On the palate, cherries, med acid, lots of power, light spice. Med(+) tannins, drying, astringent, but still with lots of structure, med(+) length. North facing slopes on 80 yr old vines. This is an unbelievable wine and I have never tasted something like this before. Opaque purple. Nose of cherries, spice, earth, light confectionary, med(+) intensity. On the palate, med(+) tannins, earth, soy, dark chocolate, lots of structure, med acid, long length, meaty finish. A good wine. No acid added and is at about 3.6-3.7 ph. I think it could use more time in new barrels. Available@Prodis Wine, 43E Joo Chiat Lane, Singapore 428103. Pale pink. Nose of herbs, medium intensity, light berry fruit, complex. On the palate, complex, herbs of Oregon, thyme, spicy, high acid and long length, light cherry finish, very unique flavours with a spiciness. Pale green colour. Nose of honeysuckle, light floral, melon, med intensity. On the palate, melon, honeydew, beautiful background of watermelon, high acid, a sort of fruit and mineral, complex, long length, slight nuttiness, med alcohol, almond nuts finish. Pale yellow colour. On the nose, yoghurt, butter, fat, a light floral, custard, fumes, light oak. On the palate, MLF, smooth, creamy, butter popcorn, med(+) alcohol and acid, sweetness on the finish, very long length, complex and graceful finish. ¾ in old and ¼ in new barrels, went through MLF. Pale green colour. On the nose, mandarin, orange, apricot, light pepper, med Intensity, complex and musky. On the palate, spice, mandarin, orange peel, gingerbread, pepper, light lychee. Purple colour. Aromas of black pepper, light bramble, earth, soy, boxwood aromas, gamey, soy sauce, so balanced and full spectrum. On the palate, fruity, redcurrants, good structure, med(+) tannins, light chalky structure, med(+) acid, very long length, herbs of rosemary and thyme, boxwood flavours. Pale gold colour. Aroma of honey, boxwood, syrup, nuts, dried figs, developing, lots of concentration, complex. On the palate, dried mangoes, high alcohol, med(+) acid, honey, mid-palate is beautiful and fat, med(+) length, straw and menthol finish, light butter. Walter McKinlay started Domaine de Mourchon in 1998 with just 35 hectares of land, planting 50% of it with Grenache and the rest with Syrah, cinsault and carignan. Domaine de Mourchon has one of the best winery layouts I have seen in a long while. The gentler handling from grape to must to wine has been well thought out with the winery separated into different floors. The grapes are handpicked and destemmed. Through a series of pipes, the grapes are brought down from 24°C to 12-14° and cold macerated for 24 hours at 14-16°C. Yeast is added and ferments for 2 weeks. Remontage is done 2 times a day, one hour each and sometimes pigeage is done. Ferment temperatures are at 26°C with jacketed tanks filled with cold water. Aging takes place in concrete and wood before bottling. Rosés are made with the pressing method. The CDR village are aged in concrete vats for 18 months while the Gran Reserve is old vines aged in barrels for 12-14 months. The whites are fermented at 17°C and then assembled. Their style of wines is one of the ripest I have come across so far in the Rhône in terms of fruit profile. I love their fresh interpretation of the CDR wines as well as the 100% varietal route they are taking. This is a winery that I would like to follow and see their development. Transparent green. Floral nose, honeysuckle, apricot, medium(+) intensity, peaches. On the palate, med(+) acid, clean and crisp, honeysuckle, nettle, peach, long length, very good acid, mouth-watering, light peach and pears. Superb quality. Purple colour. Aromas of peppercorn, medium intensity, redcurrant, light spice and stewed plums. On the palate, med(+) acid, med tannins, carpet texture, pepper, redcurrant, good spicy balance and fruit, bramble, long length, bramble fruit finish. All concrete vats and no wood. 40 year old vines on a mixture of clay, limestone and grey sandstone on steep slopes. Semi-opaque purple. Aromas of peppercorn, spice, garrigue. On the palate, lots of pepper, spice, thymes, long length, beautiful tannin structure. Freshly bottled. Concrete vats only. 35hl/ha. 40 year old vines on a mixture of clay, limestone and grey sandstone on steep slopes. Purple colour. Spicy nose, nutmeg, medium intensity, slightly unfocused on the nose. On the palate, flinty, astringent tannins, nutmeg, med length. Too young but should get better in one year’s time. Opened for 3 days. Ruby colour. The nose is still closed, spice, earthy, nutmeg, garrigue. On the palate, med acid and med(+) alcohol, short length, earthy finish, med tannins. Semi-opaque purple colour. Spicy nose, pepper, raw and earthy, cloves and spice. On the palate, high tannins, sticky texture, still young but will do well, spicy finish and med(+) length. The 2010 CDR looks very promising. It has all the fruit and already has a good length as a tank sample. 40% in oak barrel and 60% in concrete. Opaque purple. Beautiful spice nose, ripe fruit, med(+) intensity, earthy and complex, light cedar, black pepper, cloves, beautiful fruit. On the palate, high tannins, pluckery texture, lots of fruit, cracked black pepper, earth, long length, earth and black pepper finish, charcoal flavours, and charred, beautiful blackberry notes. 15hl/ha yield. 60 year old vines. Vinification in small stainless steel tanks, ageing in oak barrels (about 10 months). Semi-opaque purple. Notes of Kirsch, dried fruit, strawberries, black tea, light confectionary, med(+) intensity, caramel, stewed plums, lifted. On the palate, high tannins, mouth feel is excellent and concentrated, chocolate syrup, med acid, long length, lots of fatness from glycerol, confectionary finish. Surprisingly a lot of tannins for a Grenache. 15hl/ha yield. 60 year old vines on grey sandstone on steep slopes. Maceration in open demi-muids (600 litres) for 25 days, ageing in demi-muids and oak barrels (about 10 months). Transparent pink colour. Light aromas of fruit cake and vanilla icing. High acid on the palate, candied fruit cake, juicy, good mid-palate, long length, pure light yoghurt flavours. 40 year old vine at 35hl/ha on a mixture of clay, limestone and grey sandstone on steep slopes. Made with bleeding off and pressing. An excellent rosé. Helen Durand is a very talented winemaker who has been influenced by his time at Château de Beaucastel. All grapes are destemmed and undergo natural ferment. Remontage is done every 2-3 days. According to Helen, it takes 3 days for the cap to sink down the bottom of the tank. Pumping over is done to promote oxygen for the yeast. The macerations run from 15-16 days but never over 20 days or the extraction will be too much. Ferment temperatures are kept at 23-25°C. No acid adjustments are done. Pale green colour. A nose that is very light, med(-) intensity, straw and oats, a steely style. On the palate, lime and steel, a minerality and med(+) acid, fresh and crisp. Long length and grapefruit back palate. A lean and well-defined wine with layers of cold tea. Fermented in 225 l barrels and left for 9 months, no battonage, an impressive wine that is beautiful on the palate. Deep purple colour. Floral nose with cherries and liftedness, med(+) intensity, a sort of cola berry aroma. Juicy on the palate and long length. Flavours of berries, and strawberries. A very inviting and pleasant wine. Grown on sand and silt with a little limestone in the lower areas of Rasteau. Natural ferment in cement vats for 15 days at 20 degrees and at 28 degrees by the end of ferment. Matured on fine lees and bottled after 18 months. Since 1962, the domaine has been run by 10 generations. With 25 hectares on the slopes of Saint Martin, the vineyards are steep hills with stony yellow clay and a subsoil of blue clay and limestone. The family has the clay soils in the Les Douyes vineyard with East/North East aspect which are better for the white grapes and Syrah which ripens early for them. The other vineyard at Saint Martin with South/South-west aspect has Grenache and Mourvedre grown on it. They have plantings of 40 to 100 year old vines. Vines are pruned to 4-5 shoots with a maximum of 2 buds each with yields of around 25 hl/ha. No pesticides or chemicals are used. De-budding is done in May and leaf-thinning in June to allow air circulation for the purpose of preventing grey rot. Harvest is by hand and a second sorting is done on the table. There is also a third and final sorting at the winery. 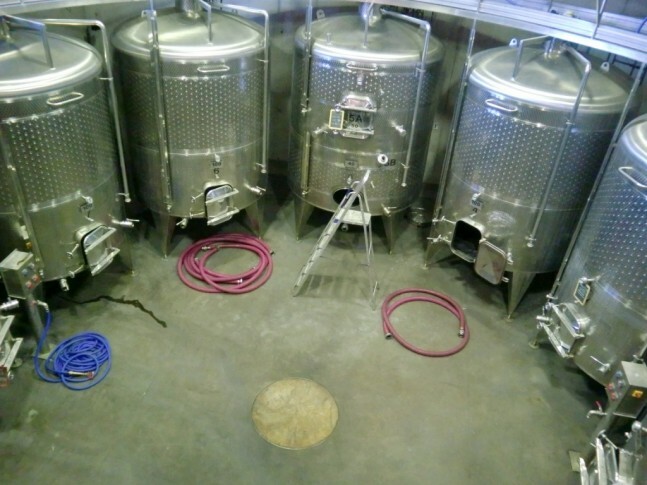 Fermentation is done in open vats with pigeage for the Cairanne wines and in closed vats with remontage for CDR. Aging is in vats or burgundy oak cask and the wines are finally bottled without fining or filtration. Transparent green colour. Nose of nuts, lees and oxidised aromas. On the palate, lees, nuts, med(+) acid, medium alcohol, med length, nutty finish. Made from younger vines of 30 years. Limestone-clay soil. Spent 6 months in vats. Recommended to serve at below 10 degree Celsius. Reminiscent of peanuts. Transparent green. Honey, nettle, med(+) I, On the palate, nuts, lemon, med(+) alch, honeyed, long length, honey finish. Opaque purple. Aromas of caramel, lactic, bramble, black pepper. On the palate, juicy, inky, med(+) tannins, chalky flavours, med(+) alco, beautiful fruit, long length, very good quality and structure. Limestone clay soil of 60 year old vines. 30hl/ha. Hand sorted, destemed, 18 days ferment with pigeage. Matured 24mths in oak barrel. Bottled without filtration or fining. Opaque purple colour. Rustic nose, plums, lactic, spice, black pepper, soy, earth, light cassis. On the palate, med(+) alcohol, black fruit, light tannins, dusty, long length, black leather, bay leaves, thyme, rosemary, grainy texture. Very good quality and sturdy texture. Good presentation of flavours. Clay limestone soil with 70yr old vines. 30hl/ha. Spent 24 months in fût. Opaque purple colour. On the nose, raw and red fruit. On the palate, red berries, black tea, med(+) tannins, pluckery texture but taste raw, med length, juicy.